Admittedly, I’m not always a fan of summer weather. We have high temperatures, and the daytime can be downright unbearable. But what we do enjoy and take advantage of are summer evenings. Despite always needing to have bug repellant handy, evenings mean we don’t have to worry about applying sunblock, donning hats and searching for shade. Also, there is something particularly special for kids about family time on a summer evening – and simply doing activities after the sun goes down. During the school year, hanging out into the evenings is something kids don’t usually get to do, making it all that much more unique and magical. Hikes in the day are great, but a hike in the evening is particularly fun. The sights and sounds of hiking in the night are much different than in the day. Also, the quiet and peacefulness of the evening is something to be relished. You may want to consider hiking a trail that you’ve already hiked recently during the day, then you and your kids can see how different the sights, sounds and smells are in the night. 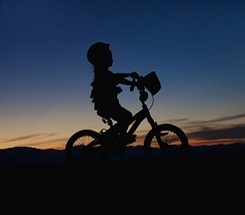 Before you set out, make sure you are well prepared and have taken all safety precautions; for example, equip your kids with headlamps or flashlights, and hike in a park that is safe and designed for night hikes – and of course, stick close together at all times. At the beginning of the summer – or earlier – we scope out the city parks and recreations programs to see what performances are offered. We love packing a picnic then heading out to see free or inexpensive theater in the park. Community colleges and local universities also usually offer free outdoor musical performances over the summer months. In addition, the cities sometimes sponsor local outdoor movies and concerts in the park. My kids enjoy bringing their sleeping bags, lying outdoors and enjoying entertainment into the night. Lay out a blanket outdoors and take turns telling stories, either ones that they have made up themselves or have heard, or perhaps stories read directly from books. Your kids may simply also enjoy hearing stories of when you were a kid, or when they were younger. If your kids are older, they may also enjoy telling scary stories. My kids also enjoy if we make a story together by taking turns adding to a story. By the time the story is completed, the plot is usually pretty ridiculous and my girls love the absurdity. There are many variations on this combination tag and hide-and-seek game, but the basic game is to have one person who is “it”. That person counts to 30 while everyone hides. Using a flashlight, the “it” person has to search for people; to tag someone, he needs to shine the light on them and call out their name. Then the first tagged person is “it”. Before playing, make sure that you’re in an area that is safe to run around, such as an enclosed space like a backyard. You don’t have to venture far to have an adventuresome evening outdoors. One of our favorite family activities is simply a walk outside after dinner, once the sun has started to set. The summer day is usually starting to get cooler, and we can digest, perhaps enjoy the sunset and walk and chat with one another. And to make the evening walk even more active, you can set up a basic scavenger hunt ahead of time. Your kids will love the nighttime thrill of using their flashlights to read clues and find small treasures. So take advantage of a summer night and have fun in the – hopefully – cool evening air.